This Strufolli recipe is for Anthony. Anthony commented on my Struffoi recipe…and gave me a great laugh. I ordered the Struffoli balls and didn’t make them… for Easter. Now it’s Christmas and time to make them again. 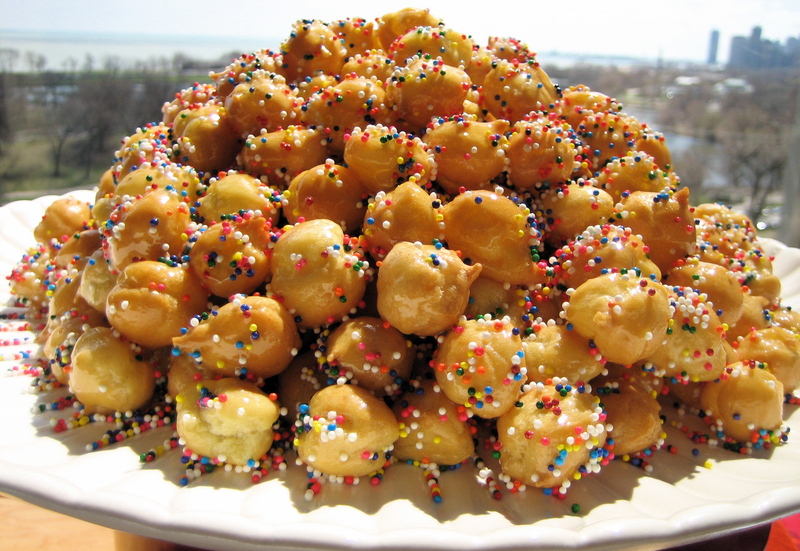 Italian Honey Balls called Struffoli also made during the Christmas holidays and piled high as a Christmas Tree! 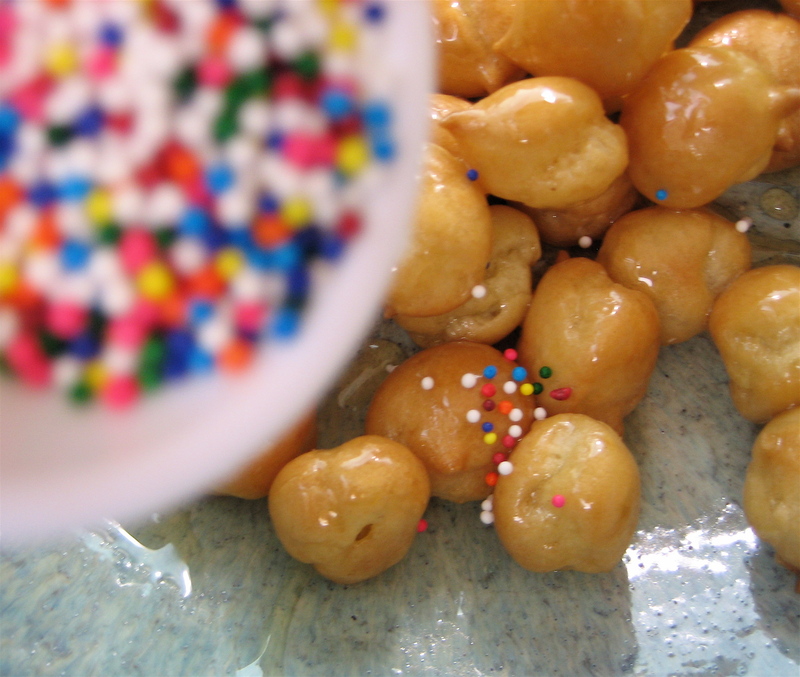 Struffoli alla Gilda Puglisi found in Beloved Family Recipes by Paolo Villoresi. Mix the flour with the baking powder and cinnamon on a breadboard or counter. Work in the butter, eggs, anisette, and vanilla. Knead until asoft pliable dough forms, about 5 minutes, adding a little flour if the dough is sticky or a little water if it is dry. Shape into a ball, place in a bowl, and cover with a damp cloth; let rise for 1 hour at room temperature. Keeping most of the dough under the damp cloth to prevent it from drying, tear off a small piece with your hands and roll it between you hands into a ½ inch thick log. Cut into ½ inch pieces. Repeat until all the dough has been cut and shaped. Heat the oil to 350˚ in a deep pan. Fry the dough in 4 or 5 batches until it is golden all over and nicely puffed, about 3 minutes per batch. Remove with a slotted spoon to a tray lined with paper towels and blot dry. Transfer to a bowl. This is the strufella or Strufolli. The Balls. 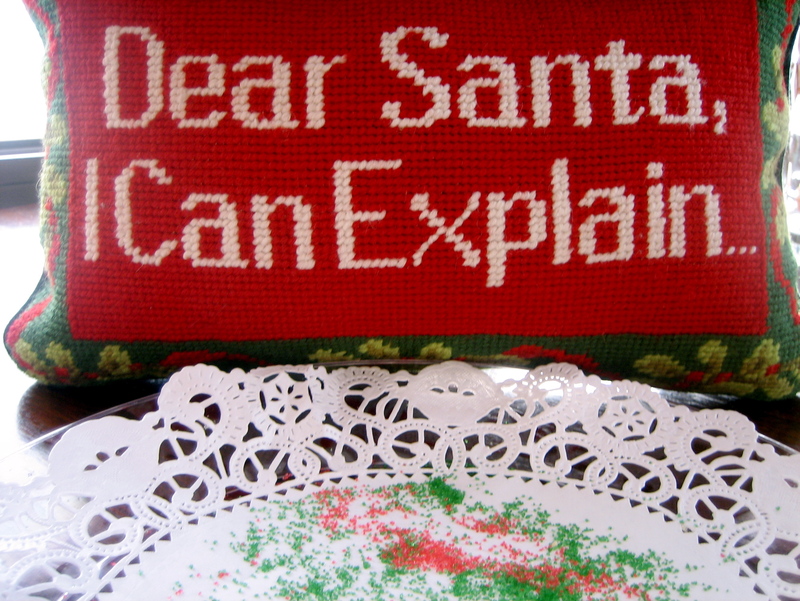 Tags: Dessert, Fun, Holiday, Party, Photography, Struffoli, thoughts on food. Bookmark the permalink. How nice to ‘see’ you this evening! Looks delish! Thanks Tami..thinking of you and Bryan. Love to you and your family! Hi. Great to see your post. OK> I was able to open the recipe and I can’t wait to try it, which I will do today. On Friday, my assistant, who is a phenomenal cook and baker and I are going to have a struffoli cook off to see who can make the best struffoli. I’m sure your recipe will get the blue ribbon. But I must be careful. I don’t want to beat her so badly that she’ll quit! 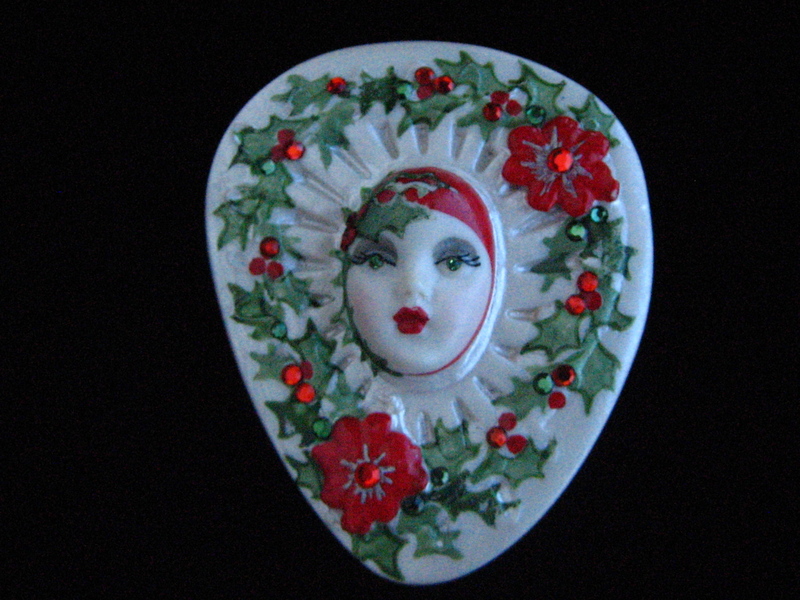 I really missed seeing my family this holiday season so I thought I’d see if our “Italian Handful” resumed blogging and she did. I wanted to thank you and congratulate you on this blog with me for quite some time. I love the atmosphere there by the color images you have selected, the daily messages … it’s part of my bubble and dreams of escape. Another Christmas is coming and New Year too! Hope all is well with you & your family. Best wishes.